If you’re in a band, you probably know how awesome it is to see someone walking around wearing a shirt with your band’s name on it. Even if that shirt was made by spray-painting your band’s name onto it, it still feels good. 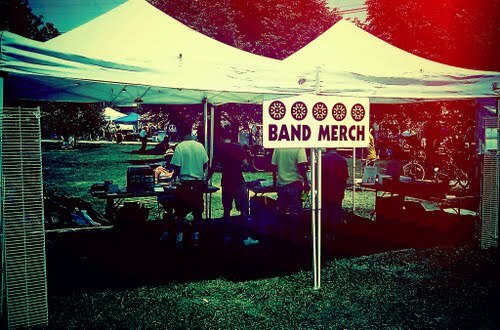 As your band grows bigger, the demand for your band’s merchandise will grow. Sure, everybody loves t-shirts and buttons with your name or logo on it, but if you really want to make some extra money by selling merchandise you should opt to make some more creative things. Check out these ideas for custom merchandise that you can sell at your shows; your fans will just about eat them up! You can make some sweet custom mugs for your band, and mugs are fairly inexpensive too meaning you can have a high profit margin. Check out the Mines Press, Inc.to see a variety of different kinds of inexpensive mugs that you can customize with your band’s name, logo, and even tour dates. Create a lot of different types of mugs so you can have a big selection to offer your fans. Create some cool ceramic coffee mugs, but don’t forget to make some sweet beer steins too! Just like custom mugs, you can get some custom frisbees from the previously mentioned site. Design them how you see fit, and they’ll be flying off the merchandise table (no pun intended). Frisbees are very cheap to produce, meaning you can have a good profit margin. They’re also fun to toss out while you’re on stage. Make some sweet custom plastic sunglasses with your band’s name or logo, and you’ll spot someone wearing them around town in no time. Plastic sunglasses are very cheap in bulk, which is why they are a great product to sell at your band’s shows. They’re a fun choice because they come in a variety of colors, and it’s cool to see a crowd full of people wearing your band’s sunglasses during an afternoon show in the hot sun. No doubt sunglasses will become one of your most popular sellers, so order some sweet custom sunglasses today and be cool! Just like sunglasses, beach balls will be a hot seller during a hot show during the summer. Beach balls are very cheap to produce with custom logos or names on them, and they’ll definitely make your summer shows more fun with the crowd bouncing around a bunch of beach balls. Make sure you keep some on the stage with your Frisbees, so you can toss them out to liven up the crowd if things start to get a little dull! While a bit more expensive, you’ve probably never seen a flashlight for sale at a merchandise booth before, have you? For night shows, having some flashlights are cool because the crowd can wave them around. The website mentioned above also offers custom flashlights from a variety of price options, so check out those options to see if one works for your band.